Tibby’s is not just about what you see, but how it makes you feel. It’s about expressing personality and character through food, music, art and heritage. It has the vibe of New Orleans funk in a very fun atmosphere. It is vibrant in expressions and true to its colors. It reflects a social gathering that feeds the soul. It’s not the New Orleans you may have visited; it is the New Orleans that locals call home. Having a celebration? The Napoleon Room at Tibby’s is the perfect place to party! 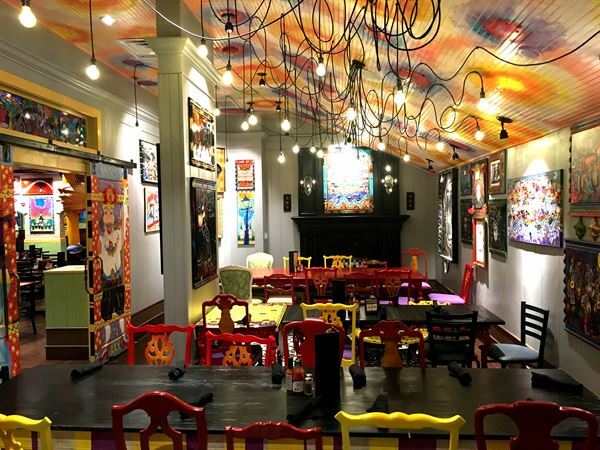 Enjoy authentic N’awlins cuisine in a festive private dining space. Guest count minimum 15, maximum 50 (with use of overflow area) $150 Food and Beverage Minimum (15-30 guests) + 18% Automatic Gratuity. $300 Food & Beverage Minimum (30-50 guests) + 18% Automatic Gratuity.